Hillel Wright has lived in Hawai`i, mainland USA, Canada, and now lives in Japan with his wife and muse, Shiori Tsuchiya. Hillel teaches at Tokyo Keizai (Economics) University; workshops in short-film making, and one Grad School seminar in 20th Century American Literature. For the past three years he's also been the Japan Correspondent for the London-based Fishing News International, which means he gets to do a lot of traveling - expenses paid - around Japan's many islands & fishing ports to take photos & write articles. Hillel's other books include, Rotary Sushi, Border Town and All Worldly Pursuits. Get them, read them,- you'll be glad. Yes, Yamada Saburo was the shacho, the company president and yes, he would have another drink. And why not? Business was good. His company, small but productive, made ship's propellers and other shipbuilding necessities and had contracts with Mitsubishi, one of the world's great conglomerates. Mitsubishi Shipbuilding here in Shimonoseki was booming. Japanese tankers and freighters roamed the world. Japanese fishing boats and research vessels worked tirelessly to satisfy the appetite of the world's #1 consumer of fish. Today Yamada-san and his employees were celebrating the delivery of twin variable pitch propellers, along with shafts and reduction gears to the 100 meter, 4,000 ton Tokyo University research vessel Hakuho Maru. It had been a big job, demanding, stressful, especially creating the mechanism for the propellers to feather – to vary pitch – both in forward and reverse gears. But Yamada-san himself, who was a born mechanical engineer – at least that was what his workers said – supervised the final operations and trials. Reiko-chan, the Mama-san of the sunaku bar near the waterfront where Yamada-san and his crew were regulars, enjoyed pouring the shacho's drinks. He enjoyed drinking, especially when Reiko-chan poured, bending over his sake cup just enough to expose a glimpse of her ample cleavage, keeping her flirtatious curves in his direct line of sight while lighting his cigarette. And the more the shacho drank, the more his workers did too. It was, after all, not polite to lag behind the boss in his celebrations. Of course flirtation was as far as things ever got between Reiko-chan and the shacho. After all, she had many other important customers to keep happy and satisfied, or to console and sympathize with when things were no so good. There were the skippers of the big off-shore trawlers and long-liners, the accountants and buyers from the fishing companies whose chaotic offices loomed over the bustling loading docks of the harbor. 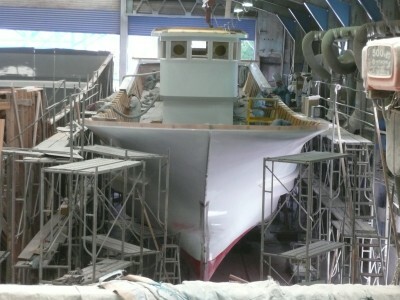 There were the foremen and section chiefs from the Mitsubishi Shipyard – the executives had their own favorite sunaku in downtown Shimonoseki – and the managers, brokers and wholesalers from the cavernous Karuto fish market. Sometimes a professor from the National Fisheries University would stop in after a training cruise on a research boat with a group of associates and graduate students. Besides, Yamada-san had a wife of his own in a nice two-story house with a garden full of fruiting and flowering trees, overlooked by a wide and south-facing balcony, almost in the countryside, on the outskirts of the city, where the rice paddies began. And Reiko-chan had her koibito and patron, the yakuza boss Miyamoto-san, who'd bought the bar for her and stopped in four or five times a month, unpredictably, but always late at night – or more accurately, early in the morning – just before the bar was getting ready to close. The shacho knew he was too drunk to drive home. He was tempted – he liked doing things for himself – but lately the TV news had been full of tragic stories of drunken drivers causing horrific accidents, of cars carrying young children rear-ended through guardrails of bridges to drown in terror in the river below, as frantic injured parents struggled heroically but helplessly to save them, or of the drunken trucker, asleep at the wheel, colliding with a bus full of elderly tourists on their way home from a day of hiking in the mountains. The blood and bent metal and bouquets of flowers at the accident sites stayed with the shacho long after the TV was turned off and often haunted his dreams. Not only that, but the shacho was a Buddhist, at least as far as his practices of making a New Year meguri, a pilgrimage to the temples of the shichifukujin, the Seven Lucky Gods, the first week of every year, and of visiting the graves of his grandparents every summer at O-Bon, the Festival of the Dead, with flowers – red, white, purple and yellow chrysanthemums, which would stay fresh for many days – and their favorite food and drink – Ritz crackers from America for obaasan, Kubota sake from Niigata for his father's father, ojiisan. Most of all, as a Buddhist, the shacho believed he should never kill or even strike another human being in anger. So Reiko-chan called a taxi, bundled the shacho in and stood at curbside waving until the cab rounded the first corner and disappeared into the darkness one hour before dawn. If Reiko-chan felt any real affection for the shacho she might have been a bit concerned – he seemed to be drinking more than ever these days, maybe because business continued to be good. But the more the shacho – and consequently his workers – drank, the better business was for Reiko-chan too. Far out at sea, hundreds of miles from Shimonoseki port, in the Western Pacific, the ocean temperature slowly, steadily began to rise. Was the cause a cyclical, natural event or a man-made environmental anomaly – global warming? Scientists have still not given us a reliable answer. Researchers have, however, tracked the results. At the bottom of the food chain, simple life-forms – plankton, diatoms and copepods – began to die off in great numbers. Newly hatched larvae of small pelagic fishes like anchovies and sardines, which depended on these micro-organisms for food, likewise died, of starvation. Next, the larger predators on the great schools of small pelagics, the marlins, the swordfish, and especially the tunas, found their food supply greatly diminished and those who did not starve on the way, crossed the ocean, to the east and south, where food could still be found. At Shimonoseki, Choshi, Kushimoto and Oma-machi, at fishing ports all across Japan, landings began to drop. First the sardines, then the mackerel and saury, after that the tuna. Scientists at Tokyo University's Ocean Research Institute begged the government to act. Bureaucrats at the Ministry of Agriculture, Forestry and Fisheries reduced the Total Allowable Catch. Leaders of fishing co-operatives taught their members how to apply for unemployment payments. Drinkers at the waterfront sunakus ordered beer instead of sake or whiskey. Or they stopped coming into the bars entirely and bought cheap one-cup jars of sake from the vending machines and lit their own cigarettes with 100 yen disposable lighters. Soon, business at the big shipyards went slack. Orders for new boats dried up. The work shifted from construction to repairs, and as time went by, fewer fishermen could afford the costly repair work done at the yards. Instead, they put their boats above the water at high tides on wooden grids and when the tide went out, attempted to do repairs and maintenance on their own. Many could not afford to go fishing at all, tied their boats up at the quay and looked for part-time work which was all but impossible to find. And as orders for marine equipment dropped, after Mitsubishi cancelled his company's contracts, the shacho turned up at Reiko-chan's sunaku alone – he had laid-off more than half his workers. The shacho, however, did not stop coming to Reiko-chan's bar. In fact, he spent more and more time there, as there was little to do at his office or around the workshop. Going home was not an option. The shacho's wife had firmly established her own routine, now that their son was in university and their daughter recently married and expecting a child of her own. She had her flower-arranging class, her lunchtime gatherings with her closest friends, her shopping excursions to Fukuoka, sometimes even to Osaka or Tokyo. Her spending money didn't diminish – not yet – the shacho was too terrified of Seiko-san's temper to cut her off. Indeed, although he couldn't believe she was unaware of the growing financial crisis around them, he continued to act like “business as usual” during the few hours he spent each day at home – mostly just beer, bath and bed – and continued to turn over to his wife the generous amount of money she'd been accustomed to receive. So the shacho spent many hours sitting alone on a stool at Reiko-chan's, pursing his lips, telling himself – and sometimes Reiko-chan – that one day soon this “recession” would be over, business would bounce back, the fishermen would go out to sea again and the orders for his company's propellers would return. Much as the shacho longed for the economy, and with it his business, to recover, in reality the financial crisis only widened and deepened. For each worker laid off, many more found their jobs threatened, with one less customer. Everyday, thousands of lost jobs added up to thousands less customers and the unemployment rate increased geometrically. “Okubo-san, what are you doing?” the shacho exclaimed in surprise as he headed down the empty street running parallel to the waterfront docks, on his way to Reiko-chan's sunaku after a long, lonely day in his office. He had tried to keep himself busy by emptying all his file cabinets, removing any papers he deemed expendable, replacing the “important” documents and burning the rest in a heater made from a 55-gallon oil drum on the workshop floor which his workers used to gather around to keep warm during lunch hours or coffee breaks on winter mornings. Okubo was one of those workers … former workers. "Building my room, shacho," was Okubo's bitter reply as he unfolded a cardboard rectangle, obviously a packing box for some household appliance, and spread it out under the eaves of an abandoned machine shop. The shacho knew the shop. It belonged to his friend Shimoyanagi-san. It was a metal-plating shop which specialized in chrome-plating metal fittings such as cleats, chocks and fairleads for sailing yachts. It was one of the first shops along this familiar waterfront road to go under. “But Okubo-san…” the shacho began to say, but could not think how to continue, as Okubo rolled a greasy, oil-stained overcoat into a make-shift pillow and spread a faded army blanket over the cardboard mattress. Finally the shacho proposed buying Okubo a drink. Okubo rose up from the floor of his “room” and stepped a couple of paces to within inches of the shacho's face. A powerful stench of sour filth and rotten detritus assaulted the shacho's nostrils. As the months passed and the economy worsened, exacerbated by nightly news reports of bankers and C.E.O.s making off with billions of yen after laying off half their workforce, or going bankrupt and into receivership, or closing their doors altogether, the shacho found it harder and harder to keep his wife Seiko-san in the dark as to the desperate reality of his company's situation. Finally, while continuing to keep Seiko-san living in her customary high-style, the shacho fell behind in the rent for his workshop and office. The bank refused him a loan. So, heart in mouth, the shacho tried to explain to Seiko-san that he was out of business, that he'd given up his building, that they'd have to live off their dwindling savings as long as they could, that he'd have to go to the city office and stand in line in the faint hope of finding part-time work, that both of them would be spending more time together at home. After weeks of fruitlessly lining up for jobs that didn't exist, the shacho gave up and stayed at home, drinking. Of course, although he could still bathe and wash his clothes at home, he could no longer afford to spend tens of thousands of yen at Reiko-chan's, having his sake poured and his cigarettes lit. At first he drank the contents, bottle by bottle, of his well-stocked bar. It was interesting at first, since there were many omiyage souvenir bottles of exotic liquors and liqueurs from Seiko-san's various travels – sugarcane shochu from Okinawa, mescal cactus liquor from Mexico, fragrant anise-flavored absinthe from France . But as the shacho sat smoking and drinking in his chair, Seiko-san seethed in anger and frustration. She punctuated the air around her with explosions of exasperated sighs. Soon Seiko-san quit making his meals, disappearing at lunchtime, no doubt using her portion of their savings to have a long restaurant luncheon with her friends. The shacho made cup noodles from the convenience store down the street. He was expected to wash his drinking glass, his chopsticks, his bowl, if he splurged on instant ramen, as well as the pot he made the soup mix in. Seiko-san eventually began to realize that their financial condition – including her personal savings – was dire and not likely to improve in the foreseeable future. So instead of long, expensive lunches with her friends, she turned to long hours in front of the TV, watching wide shows and soap operas. The shacho retreated to his small workshop behind the house and tinkered, fixing broken clocks, toasters, cassette players and other appliances on recycling days in the neighborhood junk piles. He didn't really mind the soap operas, but the level of tension ratcheted up uncomfortably when he and Seiko-san were in the same room together, and the wide shows, with their inane worship of talent-less idols and “TV talents,” and breathless devotion to following the romantic frustrations of over-the-hill songstresses, made him very close to being physically ill. Worse yet were the ubiquitous cooking shows – especially now that his own meals were Spartan and unappetizing – with marginal celebrities from the worlds of sports or entertainment exaggeratingly gushing over fried chicken or curry rice with the never-varying cry of “Oishii! !” (Delicious!!) and the disgusting close-up of a balding, 50-something comedian masticating a mouthful of boiled pork and Chinese noodles. One afternoon, when Seiko-san had gone shopping, for who knew what, the shacho was enjoying a rare moment of peace and relaxation in the living room reclining chair, bought in better times, watching a sumo tournament on NHK-TV. The broadcast had begun at 4:00 PM with the bouts of the lower-ranked wrestlers – young hopefuls on the way up, or taped together veterans on the way down – broke for a short newscast and change of ringside judges at 5:00, and continued on with the better rank-and-filers and the elite upper division champions striving for tournament victory or at least the double-digit wins record for the 15 day basho which would insure their promotion and perhaps give them a special prize. At 5:55 the final bout of the day was about to take place between the East Yokuzuna, the highest ranking Grand Champion, and the #1 West Ozeki, who had won the previous tourney and, like his opponent, was undefeated in this one. Two consecutive tournament yusho would result in his promotion to sumo's highest rank. The shacho settled back into the easy chair as the two sumotori faced each other down in the pre-bout series of warm-ups, posturing and staring matches. Finally, the referee turned his ceremonial fan towards the crouching wrestlers to indicate that the fight was now ready to begin. The shacho took a long swig of beer from his bottle. The gyoji shouted his command and the ozeki and yokozuna sprang at each other, colliding in a bone-jarring tachiai. The Grand Champion managed a grip in the challenger's mawashi belt, but the ozeki shook it off with a powerful hip twist that threw the yokozuna dangerously off balance. The shacho, stunned by this outrageous, unexpected turn of events, felt blood racing to his puzzled brain, carrying with it the anger and adrenaline to react to this insult as well as the clarity to explain it. Seiko-san stood a few feet behind him with the remote in her hand. Her fingernails were newly polished and be-jeweled. The shacho slowly, like a man in a trance, rose from his chair and approached the kitchen table. There was a faint ring of moisture where the cold beer bottle had rested after the shacho took it out of the fridge. His first impulse was to lash out, to slap the remote out of his wife's imperious yet ridiculously lacquered hand. And then to strike again, to slap her face, to color it with the blood hot red of rage, rather than the pale pink of blush it now wore. But he did not strike. He forced his anger back down his throat, into his body where it vibrated wildly in the atria and ventricles of his injured and insulted heart. The shacho was a Buddhist. He would not strike another human being in anger. Such was his firm belief. But the shacho's rage immediately turned to the instrument of his despair, the new, flat screen, high-definition TV. With robotic inexorability, Yamada-san crossed the living room to the television, grabbing it with one hand and yanking its cord out of the wall. With the other hand he slid open the glass door to the balcony and with the panache of a yokozuna executing a perfect uatenage over-arm throw, dispatched the offending electronic malefactor to its death on the stone walkway bisecting the garden below. The shacho had planned to head for Ueno Park in Tokyo, to join the community of homeless people camping there and to learn the ropes of living rough, but this overheard snippet of news piqued his native curiosity and he decided to see for himself what this beer can business was all about. So he got of the train at Shin Yokohama Station and transferred to a couple of local lines that brought him to Shin Maruko Station, the last Kawasaki stop before the train crossed the Tamagawa River into Tokyo. The station was but a 10 minute walk to the river. Strung out along the riverbank the shacho observed a collection of ao manshon – “blue mansions.” These were the jury-rigged shacks built with varying degrees of skill and utility by the homeless, with blue plastic tarps the chief structural component. Here and there, some of the more enterprising had managed to scrounge up gray felt fabric and sheets of plywood and had built rather substantial dwellings with framed windows, clotheslines, gardens, storage sheds, and in one case, even a welcome mat. The shacho spent the remainder of the day walking along the riverside, collecting and organizing flotsam that could be used for building, and in the evening made the acquaintance of one Maeda-san, who was out-going, drinking one-cup sake and, most importantly, living in a well-constructed felt-covered shack. 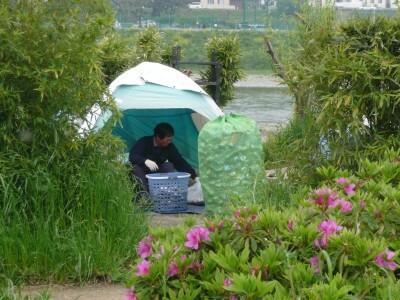 Eventually, the shacho completed his shack, about the length of a football field upstream from Maeda-san. He intended to quit drinking and sooner or later re-enter society. He knew that friendship with another alcoholic was not something he could afford. The shacho also learned how the denizens of his new community earned their living, such as it was. Early each morning, mounted on cheap one-speed mama-chari shopping bicycles, they would fan out and scour the neighbor hood garbage dumping and recycling sites, picking out cans and collecting them in large burlapesque plastic sacks, which they would pile onto carrying racks above the bike's rear fender – often extended to accommodate a bigger load – and secure them with black, heavy-duty bungee cords. Around Noon, they would begin returning to the riverside and after a lunch – most could make rice or instant ramen noodles – begin the arduous task of smashing cans in order to compress them and fit more into the sacks. At the end of the week they would strap the sacks filled with flattened cans to their bike racks, pedal to the scrap metal dealers and get the three or four thousand yen payment ($30-$40) which would have to last them the week. Joining this humble workforce didn't appeal to the shacho, but something else did. All along the riverside, sometimes in the river itself, were discarded bicycles, motor scooters and cycles, fishing rods, reels, hooks, weights and lures, and an astounding variety of household and office items which people had thrown here in order to avoid paying the city and private recycling companies demanded to haul these things away. Together with the myriad floating objects of wood and plastic which washed up after periodic flooding or bi-monthly high tides, the shacho was presented with a veritable workshop in which he could earn a living and at the same time immerse himself in enough physical labor to distract him from his need for alcohol and make possible the agonizing ordeal of quitting drinking. From sun-up to sun-down, day after day, the shacho walked the riverbank, collecting, sorting, recovering, recycling, repairing, spending hour upon hour in front of his shelter, cleaning, fixing and re-building the treasures he'd found along the river – clocks, cameras, radios, fishing reels, bicycles – and building something of real value to his homeless neighbors, something to turn them into customers: bicycle trailers and hand carts. For it was the rare homeless man who could skillfully build a balanced load of sacks of cans on his bike rack. The shacho observed many wobbling dangerously along the city streets, some falling over or spilling their loads. Many would pay him on his self-devised installment plan to obtain a trailer they could load and pull behind a bicycle, or a hand cart they could push or pull through the streets on foot. This, along with bike repairs and the creation of “new” Frankenbikes which he could sell for 1000 yen each, provided the shacho with a small but steady income. The shacho, who dropped the name “Yamada” and called himself “Sasaki”, to forever hide his identity (and disgrace), also fished constantly. He constructed traps for eels and turtles and always had them in the water. When the tides were right he sat behind his shelter on a rebuilt easy chair which had floated down the river and beached itself, like a stranded whale, on a sand bar, and fished, using earthworms for bait, for namazu catfish and black magoi and rainbow maruta carp. At night, he would venture downstream, below the Chofu-seki dam, where the river was brackish with seawater from Tokyo Bay, and catch suzuki sea bass and bora mullet with lures he salvaged at low tide lost by anglers, snagged on submerged logs, tires or rocks. He would cook the sea bass, mullet, catfish and carp on a stove he built from an abandoned oil drum, similar to the one which had once warmed his employees on the machine shop floor, but sold the unagi eels and the suppon terrapins to specialty restaurants in Shin Maruko (at the back door), and the ordinary turtles to pet shops. His life fell into a humble but satisfying routine. Nothing lasts. The global warming which raised the seawater temperature and killed the plankton, which fed the sardines, which fed the tuna was also responsible for the rising strength of typhoons and hurricanes across the globe. One summer, about five years after the shacho arrived at the Tama River, a giant typhoon struck the Kanto Plain. Many blue mansions simply blew away, driving the homeless under the bridges seeking shelter, but in the face of super strong winds and horizontal fusillades of rain, they found scant protection and an exodus across the highway and up to Shin Maruko Station began. Those like the shacho, who lived in more substantial felt and plywood structures, huddled in their rooms, hoping to weather the storm. But while this tactic kept them temporarily dry, it denied them views of the rising river, and when the dam upriver at Minami Tama burst and the torrential flood surged southward toward the sea, many of these homeless were instantly overwhelmed. The river now covered the baseball fields, the wildflower gardens, the tennis courts – the entire riverside submerged and the river continuing to swell. The shacho found himself being swept in the muddy brown surge toward the now hidden Chofu-seki dam. But there was a small treed island between his shelter and the dam and the shacho managed to grab the undulating upper braches of a half-submerged willow and hand-over-hand himself to the trunk. There, with every ounce of strength in his body, he clung to life. Hours passed. The river was a roiling conveyor of flotsam and debris. Whole trees, small boats, roofs of sheds and houses, dead livestock all rushed by the willow but the shacho saw nothing, all his energy concentrating on keeping his hold on the tree trunk. Then, little by little, the wind abated, the water level lowered, the speed of the rushing river decreased. Looking around him, the shacho could see other human forms clinging, like stylites in a desert of foam, to the trees on the invisible island. They were his neighbors, and more than that, his customers – Aoki-san, who was lame and probably thought he couldn't run fast enough to reach the high ground; Kobayashi-san, an old man who had managed to save his pet cat, a stray he'd adopted and seemed to love as a mother loves her child. The third survivor, furthest from the now visible upper portions of the dam, was Watanabe-san – a drunkard. He had probably been too drunk to think clearly when the flood struck and dumb luck had pasted him to the thick branches in which he was entangled, but alive. Suddenly, a strong gust hit the river, the trees shook violently and the shacho saw Aoki-san lose his grip and plunge into the rushing river. Instinctively, he dove in, swam mightily with the current and managed to get a hold on Aoki-san's bony wrist. With the super strength of adrenaline and desperation the shacho reached what remained of a shoreline and deposited the limp but living Aoki-san on the cement steps which led down to the baseball fields and the river from the embankment above the highway. Exhausted from his efforts, the shacho began to stretch out on the highest step when he saw old Kobayashi-san frantically flaying the water around him trying to reach his pet cat. The gust had shaken them too from their precarious perch. Without stopping to think, the shacho dove into the flood and angled out ahead of the cat which immediately, upon bumping into the body of the shacho, buried its claws into his shoulder, where they stuck in the fabric of his shirt. With both his arms free, the shacho was able to corral Kobayashi-san before he hurtled past and with a supreme effort, trundled the old man and the cat to the embankment. The shacho's heart pounded like a jackhammer in his agonized breast. But before he could make a move he heard the ungodly screams of Watanabe-san, the drunkard, piteously crying for help. The shacho had no time to think, no choice but to act. As soon as he reached Watanabe-san, the drunkard threw both his arms around the shacho's neck. The shacho struggled briefly to break the hold, but his depleted strength was no match for the panicked power of the drowning man. Drawing as deep a breath as he was able, the shacho and his burden struggled shoreward. Scientists from the Earthquake Research Institute of Tokyo University explained that a small earthquake in the ocean near Hawaii triggered a small tsunami that hit the Pacific coast of Japan at the same time the Tama River was still raging seaward while the floodtide – strengthened by the full moon – was coursing up the estuary from Tokyo Bay. This, they said, caused the anomalous rogue wave that crossed the highway and deposited the body of the homeless man Sasaki-san in the courtyard of the Buddhist temple just across the highway at the feet of the statue of Ebisu-kami, god of fishermen, farmers and business, one of the Seven Lucky Gods. But the homeless along the banks of the Tama River and the residents of the neighborhoods around Shin Maruko believed it was a miracle. After the flood waters receded and traffic on the highway resumed, the city of Kawasaki donated tents to those homeless who wished to return to the riverside. Many of them did. They had nowhere else to go. A few weeks later, as life along the river slowly returned to normal and the bicycles could be seen returning to the riverside at the noon hour bearing bags of beer cans on their carrying racks, and the afternoons were once again punctuated by the sounds of scavengers – the can-smashing of the homeless, the cawing of the jungle crows – a movement began among the survivors of the flood to memorialize Sasaki-san, who had saved three people and a cat at the expense of his own life. A small delegation approached the manager of the Nippon Ham Fighters baseball team's prospect camp, a training ground for promising young players located just west of the Chofu-seki dam. Indeed, it was on the steps leading down to their baseball field that Sasaki-san delivered Watanabe the drunkard before losing consciousness and becoming lost in the flood. Soon, the Nippon Ham Company commissioned a stone carver to create the memorial statue. A few months later, the statue, sculpted of green marble, was erected with a modest ceremony at the Ebisu temple where the shacho's body had come to its final rest. The statue contained a small group of figures. In the center was Sasaki-san (people knew nothing more about him than his alias) portrayed as somewhat resembling a jizo, the popular bodhisattvas of Japanese Buddhist mythology, found in groups of six at temples and individually along roadsides across Japan, with a shaved head and a benign and peaceful expression. To his left was a figure leaning on a cane, meant to represent Aoki-san, the cripple. To his right was a figure holding a tokkuri, the traditional sake flask, representing Watanabe-san, the drunkard. And standing at the feet of Sasaki-kami was a bearded figure holding a cat, symbolic of the old man Kobayashi-san and his beloved pet. There was also a small collection box by the statue and every day the priests would collect the coins, mostly go-en, or five yen pieces, because goen also means “good luck” in Japanese. Offerings were also left, such as seasonal fruits of the region – apple-pears, persimmons, loquats and Japanese plums - packages of instant ramen; jars of one-cup sake. Everyday, it seemed, homeless people came to pray at the statue of Sasaki-kami, Tamagawa-no-bosatsu, the Bodhisattva of the Tama River. Some prayed for safety from future typhoons and floods. Some prayed for a job, so that they could leave their tents or blue mansions and return to society, with four strong walls and a roof over their heads. And some prayed only for another jar of one-cup sake, which would help them make it through another day.